On Saturday, September 26. Eat Bulaga’s KalyeSerye’s Segment hit another milestone on social media. Where the Dabarkads, celebrate the National Pabebe wave and the second date of the AlDub Duo, Alden Richard and Maine Mendoza. Filipino all over the world support the Pabebe wave, by sending in a fan page they support and posting their Pabebe wave photos on their own social media account like Facebook, Instagram, Twitter and etc. While celebrating the Pabebe wave, fans awaits the much awaited second date of AlDub Duo, where Alden Richards allowed to visit Yaya Dub in Lola Nidoras Mansion. 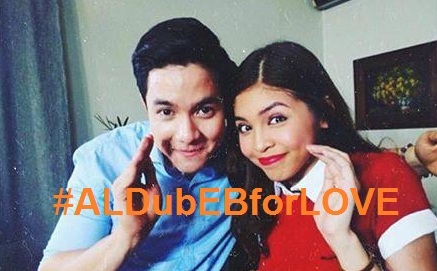 The #ALDubEBforLOVE, the official tweet AlDubs second date, earn 25.6 M Tweets, breaking the previous record of 12.1 M tweets on the first date of Alden and Yaya Dub which just only happen Saturday last week. Meanwhile counterpart noon show, ABS-CBN Showtime, celebrates their Anniversasry in Smart Areneta Coliseum in Quezon City. It features a star studded guest celebrities and Kapilya love teams. The event earn 6.33 M Tweets for #ShowtimeKapamilyaDay . the most tweet earn by the said show. Way to far from the phenomenal split screen love team “AlDubs” of GMA 7 Eat Bulaga. The Rivalry between Eat Bulaga and Showtime are heating up, as both are giving their best to win the heart of the TV viewers and netizens. But as for now the phenomenal love team of Eat Bulagas “AlDub” has the upper hands. “AlDub” is a split screen love team of Alden Richard and Maine Mendoza aka Yaya Dub, the most famous and trending love team in the Philippines. It gain popularity in a segment Juanforall, Allforjuan called KalyeSerye. For more than two months since the love team start. The duo of AlDubs, continues to rise their popularity and expected to gain more. well i guess the figure of tweets speak for itself.kaya sana tigilan na yang mga nag babash sa eat bulaga kasi pantapat lang sa kanila eh di pa nagsaalita at baka pag nasalita pa si mainne at alden in their drama baka mag zero na ang tweets ng abs-cbn. no hurt feelings lang po just accept the reality EB po ay pang kalahatan ang bigay na ligaya at di puro kabaklaan lang at ang paghahanap ng boyfriend para sa kanilang found internet pastillas.